Today I’m going to be in Hawaii! It seems fitting that I should post something Hawaii related and lucky for me, I shot this pineapple before I left. I’m hoping Hawaii is everything I dream and more. I’m definitely going to be eating my weight in pineapples. Everyone cuts their pineapples differently, but this is how my mom does it and how I do it too, when I’m not being lazy. I love the way the spiral cuts look so it’s worth the extra bit of effort because it looks so fancy. But, before I teach you how to cut a pineapple, I need to teach you how to choose one. I don’t know where I learned this from (probably Mike) but the best way to find out if a pineapple is going to be sweet is to smell their butts. You know, the bottom part of the pineapple, opposite their towering green crown. Give it a good sniff (hee hee!) and if it smells sweet and pineapple-y, you’ve got a good one. 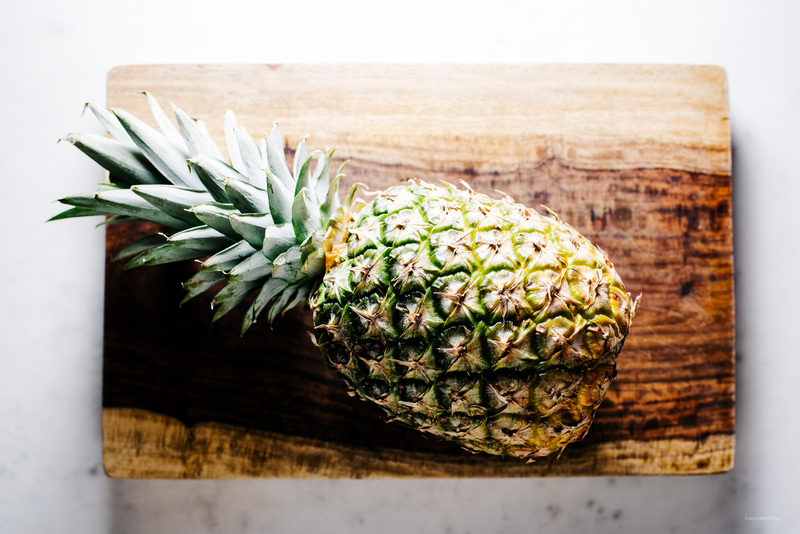 You’ll be surprised at how many pineapples you smell that smell like nothing at all. 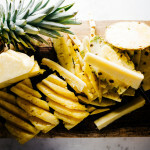 After you select your perfect pineapple, it’s just a quick lopping off of the top and bottom, then standing it up and slicing along the sides to take the skin off, following along the natural curve of the pineapple. Then, take a look at the eyes on the pineapple. Generally, the line up in a diagonal. Cut a little v-shape trench along the diagonal, taking out the eyes. 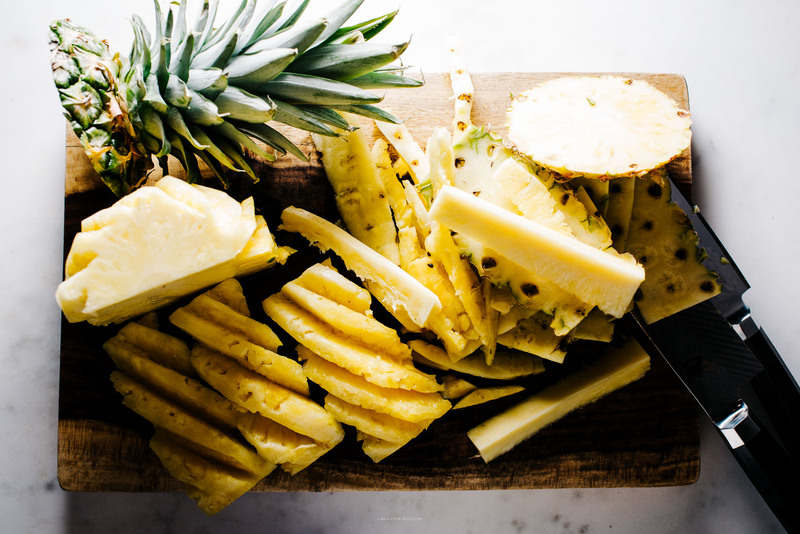 Alternatively, if you don’t mind the eyes or want to trim off a little bit of extra pineapple, you could try to slice the eyes out while you’re peeling, but when you do this you’re taking off quite a bit of fruit. It just so happens that the sweetest fruit is nearest to the skin, so I wouldn’t really recommend it. Once you’re done spiral cutting the pineapple, stand it up on it’s end again and cut it into quarters. Or, keep it on it’s side and slice lengthwise into quarters. Trim out the tough core and slice or dice as you please! 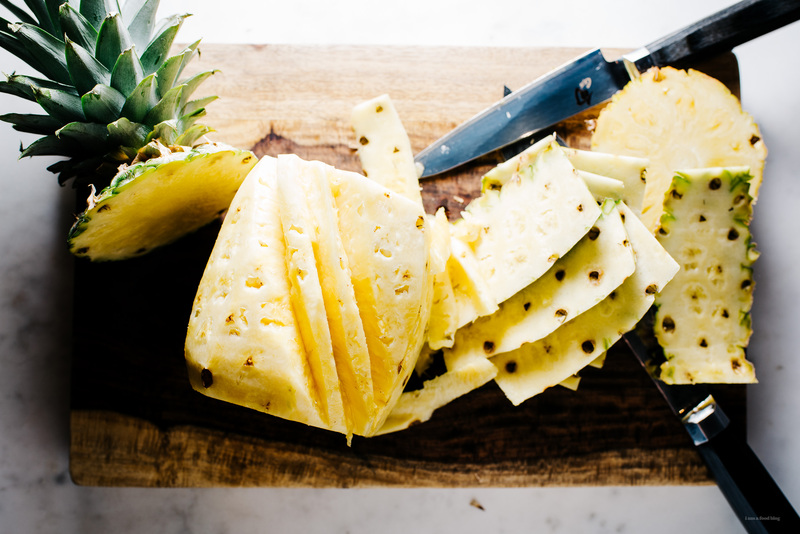 Take a sharp knife and lay your pineapple down on a cutting board. Cut off the top and bottom of the pineapple. 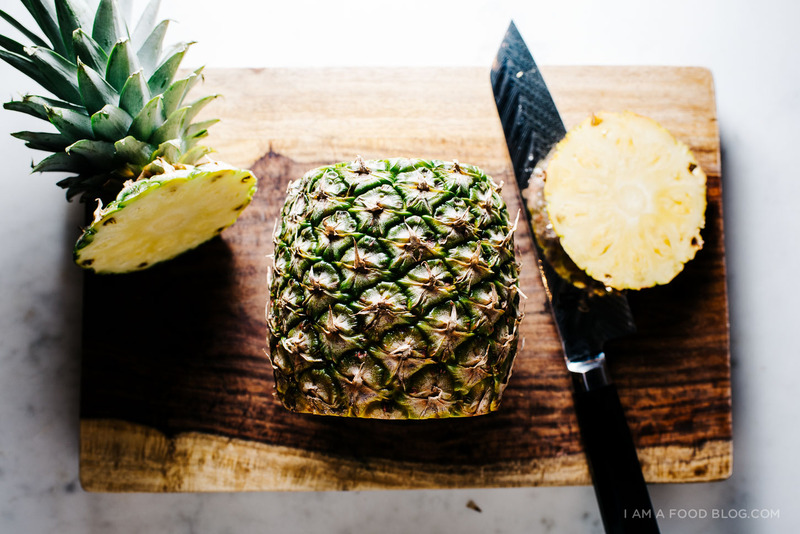 Stand the pineapple up and using a sharp knife, cut off the skin, following alongside the natural curve of the pineapple. Lay the pineapple on it’s side and take a look at the eyes. They should line up on a diagonal. Cut a v-shape trench along the diagonal, taking out the eyes. After one row, switch to the next until all of the eyes are cut out and you have a pineapple with a spiral shaped outside. 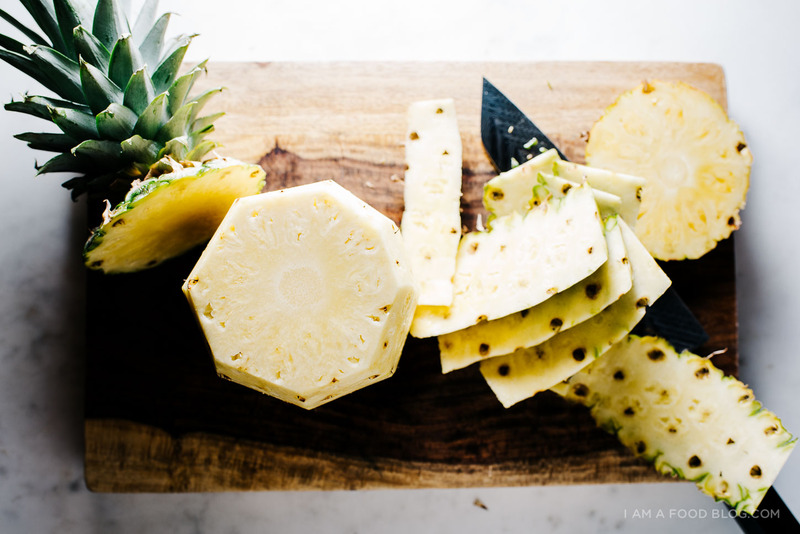 Quarter the pineapple, lengthwise and then cut out the tough core. Cut into chunks or slices as you please! Thank you for making my life about 5000000 times easier! 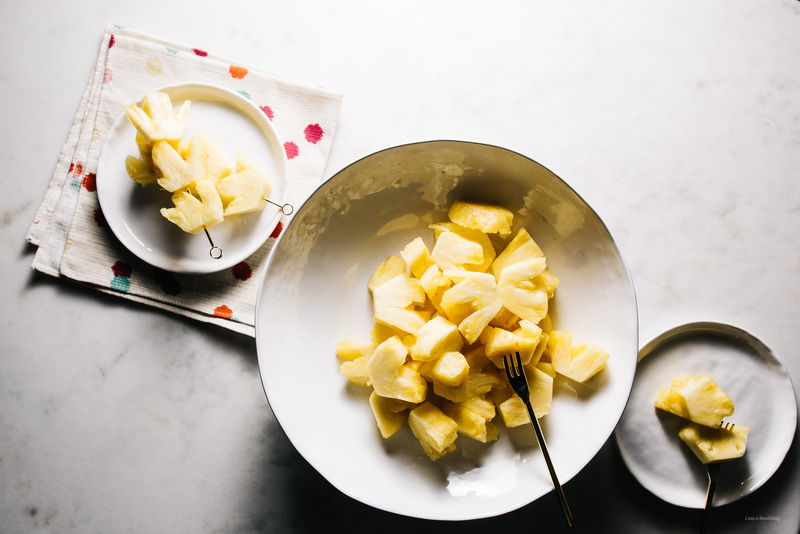 Cutting pineapples has always been a babe of my existence so this tip will save my fruit-cutting career! One summer in college I worked in the kitchen of a very popular golf course in our area. It was my job to cut the pineapples. DOZENS! Every day! I am so, so good at cutting a pineapple! It’s my favorite party trick. Well, after I swore off pineapple chopping for a few years. Hahaha! I’m always so intimidated by pineapples. Next time I see them on sale, I’ll be brave and give cutting them myself a try! Thanks for sharing! Where did you get this trick? It’s so pretty! I’ve always wondered whenever I see peeled pineapples displayed in groceries and they have this diagonal thing. I thought it was just a design. Now I know why, I’ll try peeling and slicing one this weekend. I knew there would be a trick! I either have a pineapple full of the “eyes” or one that’s had it’s eyes gauged out in the worst possible manner. Your method is much prettier. we are so into Friday night pi~a coladas at my house right now–thanks for the tip! Love, love, love all your photos! I’m going on a trip at the end of this summer, and want to have a good camera to take with me. What camera do you use? hi, i use a nikon d810 :) it’s kinda big for travel tho!